(English, PDF) is original, I can be obtained from the following link. Transport for work in a factory of urban areas to the east China from region to recruit young Uighur woman (1) (also known as Xinjiang Uygur Autonomous Region) East Turkestan in the new policy of the People's Republic of China, Uighur-majority It is carried out. You have facilitated advertise permitted to be a positive experience overwhelmingly for Uighur women this plan is recruiting slogan which is propaganda official, with less than two years from the beginning of this policy, it was broken result of family discrete promise has just left. Local executives subject to intense pressure from the upper part of the Government of the People's Republic of China, is used in order to participate in this plan to recruit women, the 欺計 intimidation, and pressure,. Under this policy, pulled away from the family they thousands of Uighur woman was thousands of miles away from home, and they've been placed on the labor conditions of the following standard. - I focus on the South East Turkestan highest in the People's Republic of China within the Uighur resident ratio at the center of traditional Uighur culture. -I to target women of marriageable age to 25 years from 16 years. · I force that to participate in this plan threatened and their families women. · Threaten with threatened dismissal from the position of local leaders do not agree to this policy. · I put under the employer that does not respect the labor contract and inhumane working conditions young women. Young Uighur woman transfer of this government support is a problem that must be considered in a broad context rather than cultural attacks and human rights violations against Uighurs promoted by the People's Republic of China. Take a moderate form of Sunni Islam, the religion of Uighurs is an important part of the ethnic identity of Uighurs, but is violently suppressed (2). Legislation is used as a suppression device, is to be utilized for any Uighurs gave voice to dissatisfaction with the government's torture and arbitrary detention (3). Appears to be applied excessively to Uighur death penalty and "political crime" charges (4). The suffering to abortion and sterilization forced, in rural areas of East Turkestan have been used slave labor is still working Uighur women (5). In addition, and at the same time implement policies to transport young women from East Turkestan under the pretext to provide economic opportunities, the People's Republic of China authorities, to the region of Han Chinese economic migration of huge number of people on the one hand in turn, it helps to flow (6). In view of these facts, this Uighur woman transport policy, is considered to be another aspect of the effort to break the foundation of a unique culture of Uighur East Turkistan Uighur and forced assimilation of Beijing. In recent years, we have been taught that to support the migration to the cities from the countryside as a means for solving poverty in the region in the job classification of all of the Xinjiang Uygur Autonomous Region People's Republic of China government central government (7). According to the statistics of the People's Republic of China, about 100,000 people are working in the borough out of the East Turkestan in 2007. Many of the migrant workers of these are located in Shandong, Beijing, Tianjin, and Shanghai, (8). Since the spring of 2006, is occupied by young Uighur women the majority of migrant workers, is supplied as workers for the factory in East China is recruited by the government's plan (9). Are targeting in particular women up to 25 years from 16 years of East Turkestan southern region of unique Uighur culture remains strong, a large number of Uighurs live this transfer policy, (10). In some cases, local executives along with the person in charge of the factory, to propose the training of professional and Chinese women, promise transportation costs to the factory wages and attractive (11). In the series of articles the plan, to convey as it's way to supply a source of income to local people, incorporate the women of the motherland China to "large socialist family", newspaper of the official in China has supported the plan (12). The coverage of this kind, it is emphasized that teach that the Uighur woman transport plan to improve the "consciousness and thinking" of women, to be civilized to improve the practice they can (13). Kashi district of East Turkestan southern region's more than 89% of the population of about 3.5 million people are Uighurs, but it has become a special target of the transfer policy. Ascertaining the exact number is difficult, but this plan has a large scale has been exposed in the survey a third party with the coverage of state media. Peizuawatto (Gaya nurses) province is one of the 12 administrative districts of Kashgar district, but the majority are Uighurs in the agricultural areas of the population of 320,000 people. Were those transport policy of the People's Republic of China appeared in April 2006 in the region in the first, but that is transported to the plant in Zhejiang, the sea salt Uyghur women of 212 patients (14). Uighur woman of 121 people of 20 years old from 18-year-old has been transferred to Tianjin Han 沽区 from Peizuawatto County under the same plan in September 2006 (15). It was over 3,000 already number of Uighur women who were transferred from the Peizuawatto County within the first three months of 2007 (16). It is possible to mark the transfer of this kind in the province of almost all Kashi area. Uighur woman of 186 people in March 2007 has been sent to the factory Zhejiang Province, Pinghu by county Communist Party Standing Committee that the I~engishaharu (Eikichisuna) province (17). Sent to Tianjin Uyghur women of 400 people in April and March 2007 Kargilik (Ha-jo) Ken (18). Sent a Uighur woman of more than 770 groups of 6 in business six different of Tianjin Konashaharu (疏附) Ken (19). At the end of March 2007 sent Shandong Province, Qingdao Uyghur 300 women Yarkand (莎車) Ken (20). Qingdao Metropolitan Zhejiang, Uighur women Yarkand Prefecture of 500 people were sent as part of the official plan of transfer of Uighur women of 6000 people a year in early 2007 (21). Most of the (young woman) is a translation would come out of necessity, but the ladies room than as something the hotel or daughters are, and will get the ($ 280) 2000 yuan per month parents of some When I come to be ... they had been convinced that it will allo, all is had different (22). Local executives are exposed under the strong pressure of trying to enforce this transfer policy of the People's Republic of China government upper echelon. Awut Teyip is the head of Yarkand Prefecture ninth village, showed that the policy is derived from Beijing while talking about their efforts to recruit young women from his village. The Kan'in many are removed from their positions if you refused to recruit women to the plan "(23). Thing follow without the guidance of the center, one also question our work" (24) . People's Republic of China's leaders is you're using 欺計, pressure, intimidation in the process of recruiting for transport young women as a result. Tout "to supply employment opportunities, to generate income" as a means for the family of Uighur in rural areas the plan district executive (25). However, a report from a woman who were recruited, that very little than what was promised has been exposed to financial benefits from this transfer in interviews with their families. When it is come to take, we were told 500 yuan per month and get fixed salary ($ 70). However, it was said to be a commission after it came to this place. We had Owarase work assigned to receive payment. However, to finish in time was impossible (26). The big problem is that they have been pending for months as a "savings" further on income, including salary. That is, including a reduction for expenses such as gold that was promised or deduction for medical problems that occur in duties within, and be paid to women in us, that it was paid to a third party (27). Said to have paid to the government Kan'in the transportation costs, and yet the company minus the gold from the salary of women company. I do not know Who went with the money. It will deduct this month in the first month, they drew 50 yuan, and, 10 yuan the next month. It will be refunded to subtract total (cost) they pay (28). I have come here my teacher was because begged me. In order to convince me, because the government sent my teacher (29). I did not want to go. My parents also did not agree. However, people of the government I forced my parents (31). Another example, is the father of Aynisa Tohti that has been transported, accompanied by officials of the village in March 2007 along with the other young women of 212 people. He is listening, was forced to allow to leave with my daughter, but said it has been deeply regret this decision (32). Family in rural areas, are threatened by punishment of all kinds to be resistance to the plan from local Kan'in. For example, leaders of the ninth village of Yarkand Prefecture, are threatened by farmers threatened the destruction of houses and confiscation of agricultural land, unless allowed to enlist if daughters. In the same village, If you do not select that young women fall into this plan, then the you are threatened by denial of marriage documents and confiscation of residence registration certificate and (33). There is no mercy in opposition to the transfer plan. In April 2007, at a meeting of government who participated in all of us is Kan'in about this plan, history DaiTsuyoshi of Kashgar district Communist Party secretary said as follows: guidance policy of first comprehensive and the transfer of "rural labor force is, those that interfere with working the Uighur people in the. Ministry outside is accompanied closely the development of the future of our region is a sinner of Kashgar, July is a sinner of the Uighur people (34). "2007 to, parents of Uighur protested peacefully to the deportation policy in Kuqa County, Aksu district. The protests were forcibly dispersed, but are looking for the organizer still local authorities (35). We refer to this as prison this place. I think that there is no difference between the prison here and I (36). Uighur women would know the severe restriction of freedom and the environment, and strict working hours of the breach of contract as soon as we arrived at the factory. We worked 10 hours or more each day. Then, it had to work overtime on the day most. Get off work at 5 usually, but returned to work for the shift of one another when it comes to 6:00, to work 2:00 early morning, up to 3:00 (37). Without overtime pay are women, that is sometimes forced to work continuously for 24 hours (38). In the morning, I give me to us water and a small amount of rice they cooked. It is also when only potatoes fried and when only cabbage fried night. It is not possible to eat insects may not contain in the meal in very filthy (39). Did you look at our dorm? There is no roof, no doors, anyone can come on at any time. Safety and, no, everywhere open so that our change of clothes is also a difficulty (40). Cause health problems such as skin disease and kidney disease problem of young women who were transferred unsanitary working conditions and heavy workload (41). Many local governments impose a heavy fine for the family of women who left the labor contract. It is over ($ 700 from 420) 5000 RMB from 3000 but for the Uighur rural home is a huge the fine (42). No assistance to women who want to leave the factory even without fine of this kind, and far distance, language barriers, it is itself facing a shortage of funds. And at the same time transferred to the East China East Turkestan from a young Uighur woman, Government of the People's Republic of China is supporting the economic migration of tens of thousands of Han Chinese flowing into the region in search of work. This transfer of Han Chinese is responsible for the dramatic demographic transformation exposure to the threat Uighur culture. 1955, Uighurs is 74.7 percent of the total population of East Turkestan, was 6.1% Han Chinese (43). Today, Uyghurs is 45% of the population, Han is 41%, but it excludes many of the immigrant population People's Liberation Army soldiers, and Chinese security forces the number is (44). It has participated in the transfer of farmers of 500,000 people from Gansu is support to the government in 2006 alone, many of which earns 10 weeks the amount Uighurs of one person make in a year (45). In order to facilitate the transfer of huge number of people like this, recruiting workers from rural areas, and organize special train, to give a benefit, the leaders of the People's Republic of China to print the brochure would be helpful, has given logistical support in the to and from a train station (46). Uighur they've been pushed out of the public aspects in large influx of this immigration. Business of Han has replaced the tempo of the Uighurs. Development of the People's Republic of China format they've changed the layout of the city of Uighur that have evolved over the centuries in just three decades. Uighurs, have seen that it is because of the Han residents unfavorable economic himself has come new. It has been found ". That there is a strong correlation to high income per capita and the region of the majority Han Chinese" that the study of the 2000 census, but not the relationship correlation of just one ", this discovery normally According to industry statistics (47). "in 1995 and is one that is found, only two of the management of 191 people of medium business or a large scale in Eastern Turkestan, and the minority, these only 11% of the business is based in areas where ethnic minorities account for the majority (48). Employment of public services is showing prejudice against Uighurs, have been prepared for the Han Chinese majority of employment opportunities (49). Occupational other, for example, even in work "professional, technical" a, the number of employed ethnic minorities is not have increased almost in spite of the high economic growth rate of East Turkestan (50). The relationship between the transfer to East Turkestan of Han Chinese and transfer of young Uyghur women from the South East Turkestan, you do not seem to be in harmony. As already mentioned, transfer to the East China of young Uighur woman is considered "is a guidance policy of first,., Which is accompanied closely the development of the future of our region," said Kashgar district Communist Party top . Is the focus of a substantial "redevelopment" now, by the completion of the railway, which brings thousands of Han Chinese, Kashgar district was ligated with recently-ku-ku, Urumqi. Component rate of Uighurs have been decreasing year by year in East Turkestan. However, the driving force behind this has been aided by the transfer of Han Chinese, and mass transfer from the East Turkestan young Uighur women of childbearing age are to be severely disrupted this process. Currently, local and central authorities of the People's Republic of China, continues to actively enforce this transfer policy despite anger and resistance to this plan of Uighurs. Continue this policy alienated further Uighurs, to deepen the distrust of the People's Republic of China Kan'in Uighur, would guide the great social tensions further in East Turkestan. 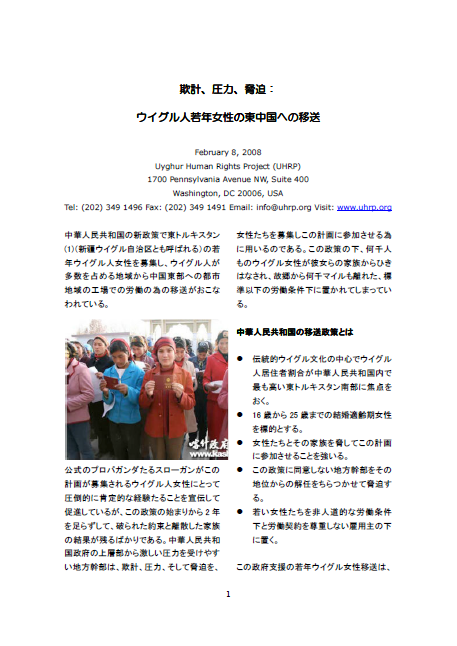 Uyghur human rights project to recommend the following to the People's Republic of China. · Stop the transfer from the East Turkestan young Uighur woman immediately, shalt allow the return of women to the home, et al. · Shalt make a guarantee to women the contract for travel expenses and work done. · Shalt be enforcement policies that create employment opportunities for local Uighur woman. · Shalt Bassu the Kan'in et al were transported against their will by force a woman, et al. By using the term "East Turkestan" is not intended to clarify the position of "independent favor" 1.. "East Turkestan" is used by Uighurs want to claim the cultural uniqueness of China to inland rather than it. Means "new area" or "new boundary" and "Xinjiang", but came to be used officially in 1884, given by (-1911 year 1644) Qing dynasty, the Qing people I reflect the view. Use of this term, that is, whether the "Xinjiang" is whether the "East Turkestan", is comparable to using terms that Tibetans say "Tibet" from the viewpoint of the Uighurs. In other words, the Tibetans is that it is not a translation means storehouse of treasure of the western part of the Chinese of "Tibet", and that use the name they chose.
. 2 Human Rights Watch and Human Rights in China, Devastating Blows:.. Religious Repression of Uighurs in Xinjiang, Human Rights Watch, Vol 17, No 2, April2005.
. 3 Amnesty International, Gross Violations of Human Rights in the Uighur Autonomous Region, London: Amnesty International, 1999.
. 5 Ildikó Bellér Hann, "Work and gender among Uighur villagers in southern Xinjiang," in:. Les Ouïgours au XXème siècle Cahiers d'Études sur la Méditerranée Orientale et le Monde Turco-Iranien, F. Aubin and J.-F. Besson, eds. (1998) pp. 93-114.
. 6 Stanely Toops, "The Demography of Xinjiang," in Xinjiang: China's Muslim Borderland, ed S. Fredrick Starr. (ME Sharpe: Amrmonk, NY, 2004). and DT, "Uyghur Culture Faced with Endless Campaigns," China Rights Forum, No. 4, December 2007, pp. 100-101. 16. Radio Free Asia, Last Year Labor Force Transfer from Kashgar Reached 240,000, Mar. 19, 2007. 21. Radio Free Asia, 500 Uyghur Girls Transferred to Chinese Provinces, Mar. 30, 2007. 2007 interview Uighur women who were 22. Transfer of the (number 3), Tianjin. Interview that was used in this report were collected in the project under a joint international Uyghur human rights Democracy Fund (IUHRDF) and (ETIC) East Turkestan Information Center in July and May 2007.
. 23 Radio Free Asia, Revealed Secrets: Real Stories of Uyghur Girls Forced to go to Chinese Provinces-Part I and II, June 21 and 22, 2007.
. 30 Radio Free Asia, Revealed Secrets: Real Stories of Uyghur Girls Forced to go to Chinese Provinces-Part I and II, June 21 and 22, 2007.
. 32 Radio Free Asia, Revealed Secrets: Real Stories of Uyghur Girls Forced to go to Chinese Provinces-Part I and II, June 21 and 22, 2007. 35. Radio Free Asia interview with official in Kucha County, Aksu Province, July 19, 2007. 38. Radio Free Asia, A Uyghur 'Worker' Girl's Story who was Forced to Flee from China, Jun. 28, 2007.
. 43 Stanely Toops, "The Demography of Xinjiang," in Xinjiang:. China's Muslim Borderland ed S. Fredrick Starr (ME Sharpe: Amrmonk, NY, 2004). 44. Ibid. And Department of Population, Social, Science and Technology Statistics of the National Bureau of Statistics of China [National Statistics Bureau population sum Social Science and Technology Statistics Tsukasa].
. 47 David Bachman,. "Making Xinjiang Safe for the Han:? Contradictions and Ironies of Chinese Governance in China's northwest," in Governing China's MultiethnicFrontiers, ed Morris Rossabi (Seattle: University of Washington Press, 2004). 49. Congressional-Executive Commission on China, Xinjiang Government Says Ethnic Han Chinese Will Get 500 of 700 New Civil Service Appointments, April 7, 2005.
. 50 Linda Benson, "Education and Social Mobility," in Xinjiang:. China's Muslim Borderland ed S. Fredrick Starr (ME Sharpe: Amrmonk, NY, 2004): 190-215.